from the American Experience documentary series We Shall Remain about the history of Native peoples in the U.S.
On the night of February 27, 1973, fifty-four cars rolled, horns blaring, into a small hamlet on the Pine Ridge Indian Reservation. Within hours, some 200 Oglala Lakota and American Indian Movement (AIM) activists had seized the few major buildings in town and police had cordoned off the area. 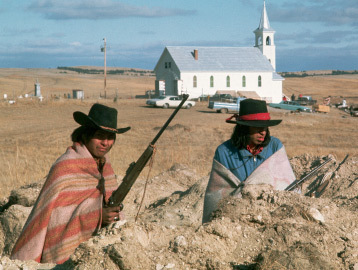 The occupation of Wounded Knee had begun. Demanding redress for grievances-some going back more than 100 years-the protesters captured the world's attention for 71 gripping days. From Wounded Knee to Standing Rock, North Dakota, the Native peoples in the U.S. have resisted oppression: genocide, the theft of their land, being forced off their land and onto reservations. Children were stolen from their families and held in boarding schools where they were stripped of their language, culture and indoctrinated in Christianity. The history of the Native people has been one of resistance to barbaric oppression from the earliest times to today. As we write this, Standing Rock, North Dakota is a decisive concentration point in the battle against the oppression of Native people today which shapes the grounds that people are going to fight against the incoming fascist Trump regime. Directed by Stanley Nelson whose work includes: Freedom Riders; The Black Panthers; Freedom Summer; and The Murder of Emmett Till.